Low-profile aluminium-framed opening vents can be installed in pitched and flat roofs. They are generally manufactured to a maximum size of 750mm wide by 1500mm deep and can accommodate 6-24mm thick single-glazed infills. 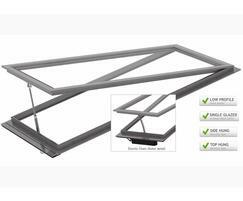 In a typical roof application, its recommended location will be at the top of the patent glazing, although in certain instances these vents can be positioned in the centre or lower parts by using alternative top and bottom panel sections. Depending on the size of opening vent and gearing type used the general maximum stroke length achieved will be around 400mm. Operation: manual, remote controlled, electrical.